Micropay has been available on the Irish market since 1982. Following on from the success of the early DOS days of Micropay 2000, Sage Micropay evolved into Micropay for Windows and now comes the latest release of Ireland’s best known payroll solution, Micropay Professional. Micropay Professional is a sophisticated yet easy-to-use payroll designed to address the Irish Payroll needs of the SME sector. Harnessing the latest technologies, Micropay Professional is highly customisable, with the flexibility to handle advanced reporting while taking care of all Revenue Commissioner requirements – including PRSA's and Benefit in Kind (BIK) & Local Propert Tax (LPT). 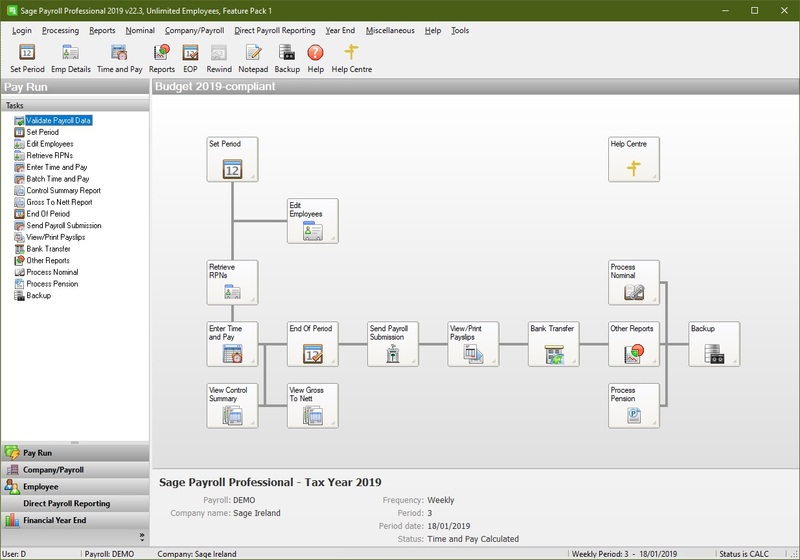 Process map guides users through everyday payroll tasks. Expert support and step-by-step guide for easy payroll year end (PYE) processing. Intergrated Excel reporting for further analysis. Calculate and track hiliday entitlements. Batch time and pay entry. Handles constrution workers pension scheme (CWPS) filling. Assign employee's time to multiple departments and cost centres. Set formula based payments and deductions to calculate wages. Report on costs based on your company's finacial year. Create your own reports in the Advanced Report Writer (ARW). For more information of the features and benefits of using Sage Micropay Professional, for infomation on pricing or to arrange a demonstration, please contact us on (01) 4011833 or by using the contact us link below. If you are already using Micropay Professional and you are looking for an expert support provider, please contact us and we will be happy to discuss your requirements. References are available on request.